This Irish Snowglobe features the pot of gold at the end of the rainbow and a leprechaun. 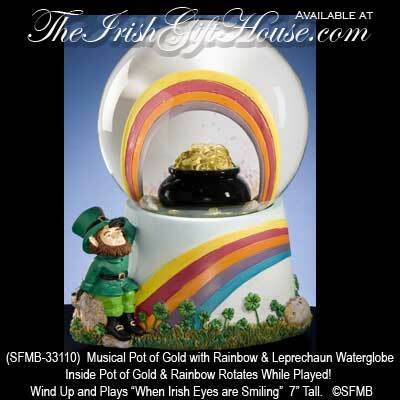 The pot of gold and the rainbow inside the Irish snowglobe rotates while played! Musical Pot of Gold with Rainbow and Leprechaun Snowglobe. 7” Tall. From the The San Francisco Music Box Company.